The state of Mississippi is no stranger to bad PR. If anything, good PR never seems to quite fit on their skin. A national spotlight on the state usually reflects its less attractive qualities. Perhaps as a defense mechanism, Mississippians decided to keep to themselves instead of listen to the opinions of outsiders. In regards to the University of Mississippi (Ole Miss) Football Program, that hasn’t been so hard… until now. To be fair, Ole Miss wasn’t always ignored by the college football world. Heading into the 1962 football season all eyes were on the Ole Miss Rebels. They ended the season undefeated. However, despite their performance the Football Writers ranked them outside of the top two positions; without a shot to play for the national title. The national spotlight shined bright on their football program throughout the season but it also cast a light on the racial riot that took place in front of the Lyceum that fall. 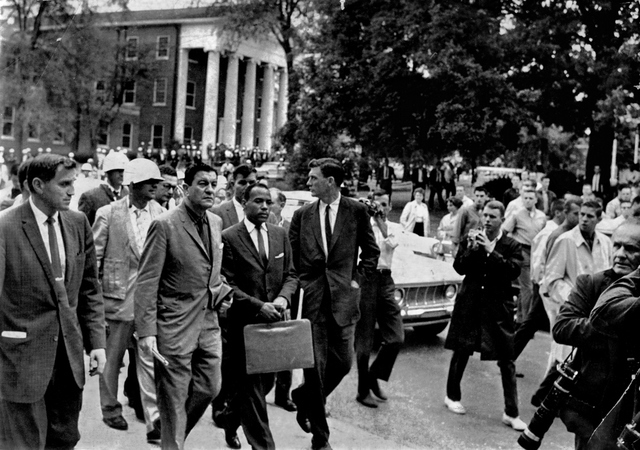 When James Meredith, an African-American, arrived on campus to register an enraged, angry mob arrived in resistance. Presumably, the national voters could not reconcile allowing Ole Miss to win a national championship on the football field while culturally losing the battle against racism. By 1963 the football program began a decline that would continue in earnest for nearly fifty years. I will never forget the first time I stepped foot onto the Ole Miss campus. As I remember it, the magical soul of Ole Miss washed over me in an instant. It was love at first sight. I bought an Ole Miss sweatshirt, decided I would one day be a student on that hallowed ground, and immediately started rooting for Ole Miss over my dad’s alma mater, the Alabama Crimson Tide. I was twelve years old. I returned to Oxford twice before arriving on campus as a freshman. In the fall of 1993 I dangled off the side of the end zone bleachers while watching my beloved Ole Miss Rebels lose to Alabama 19-14. Once again, in the spring of 1996, I paid an official campus visit to my soon-to-be university. I bought a journal at Square Books, found a coffee shop, and penned these words: “Oxford, I am home.” I was home. Home, a place in which we find comfort and peace. Where the heart is. Where our identity ignites. This was, and continues to be, Ole Miss to me. As a native of the state next door I know too well that Alabamians take pride in ranking at least one spot higher than Mississippi in society and about a million spots higher in sports. However, Alabama and Mississippi intimately share a history wrought with destructive government platforms and social actions before, during, and even after the Civil Rights Movement. As a high school student in Birmingham I was well-educated on my city and state’s role in these racist atrocities. Somehow, I missed the exact details about Mississippi and Ole Miss. I first learned about James Meredith’s brave walk through the Lyceum in a sophomore history class. My professor told the story of racial riots designed to keep Meredith from entering the school doors. Also during my sophomore year, the administration and the football coach asked the fans (in particular the students) to stop bringing the Confederate battle flag to football games. In an instant it all made sense, and reality began to overwhelm me. Ole Miss: my beloved, my new home, perhaps now, my shadowed home. But in my heart, I knew that good co-existed in Oxford and on the Ole Miss campus. I saw a humble decency in the eyes and actions of so many. I saw the promise of true diversity evolving from within a people on the cusp of a cultural renaissance. Fortunately, so did someone else. I came to Ole Miss the same year Robert Khayat became the chancellor. He too loved Ole Miss but knew it was still suffering from a stained legacy and a regressive mentality. As a native Mississippian, Khayat knew that the national spotlight could sting the skin. But he also knew that Ole Miss had a foundation of honest, decent, diverse, and hardworking (albeit battle torn) people who were ripe for change. He vowed to return Ole Miss to prominence as a Great American University. However, in order to progress he had to make a series of difficult decisions concerning the school’s attachment to the past. A contingent of alumni and fans confronted each change with resistance; resistance that, rightfully, caught the eye of the national spotlight. It seemed as though Ole Miss could not win for losing. On the football field, America’s biggest stage for universities and the South’s biggest bragging right, Ole Miss just couldn’t win. Perhaps this was a good thing as it kept attention away during a series of growth years. Growth is hard and not always pretty. Perhaps the two were more intimately married; maybe Ole Miss could not field a decent football team because of past problems or even their present transition. Perhaps the football team continued to lose because of questionable personnel decisions and a lack of solid leadership. 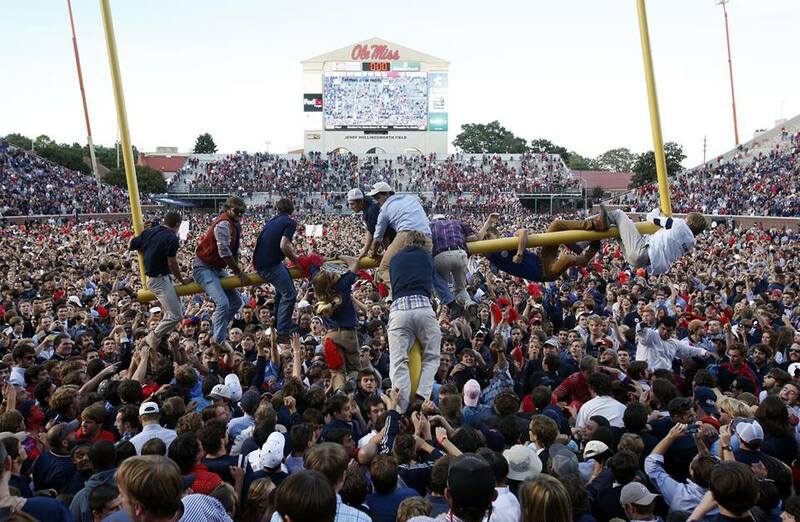 Regardless, Ole Miss was a sports program that no one with staying power wanted to touch with a ten-foot pole. Then, a native son of Mississippi came home. When Hugh Freeze arrived as the new Ole Miss head football coach in 2012 he nearly cried at the press conference while declaring that he and his family were home to stay. Freeze walked into Ole Miss representing the good in Mississippi: grounded as the soil, hardworking as the farm from whence he came, and genuinely loving in the name of God. He stands uniquely positioned to lead this team and community into the next Ole Miss era. He is traditional enough to remain grounded in his roots; yet, progressive enough to avoid being blinded by the detrimental demons of his state’s past. We, as the Ole Miss Rebel family, have been grappling with our past meeting our future. Recently, this discussion has become quite public. On the largest sports channel in the world, ESPN, Wright Thompson displays his evolving perspectives of his Ole Miss. His documentary, The Ghosts of Ole Miss, revealed the demons of his own Mississippi past. He regaled his personal struggle to reconcile the haunting Mississippi with the up lifting Mississippi. Ole Miss alumnus and Oxford folk historian, John Cofield, recently guided the Ole Miss following to not forget that “our lure is our lore” but the past is more black and white than it is grey “and, too often, mixed with the blues.” Meanwhile, Fox News reporter, Shepard Smith, cannot contain his passion for his alma mater. As a Mississippi native he is intimately aware of the flaws and missteps but is doing his part to build a positive Ole Miss media presence, one that speaks to the glorious fun of the Ole Miss faithful. And I, an American historian living in Germany, cannot let go of my grasp, my roots in the halls of a Mississippi university. I am all too aware that my path to this place began in an Ole Miss history department, or even with a sweatshirt and a dream at twelve years old. Just when I began to see the tarnish fade on my dream of an idyllic Ole Miss I was confronted by the complex realities of being Southern. From a classroom in Barnard Observatory with a Grove view my Southern Studies professors clarified the contradictions, and I began to intellectualize the Southerner’s plight of mixing both pride and shame while looking backward and daring to move forward. The Lyceum, Ole Miss’ oldest and finest building, has seen it all and the weekend of October 4th was no exception. Once again, her graceful stature stood prominently in the background as the media swarmed her oak lined grounds. 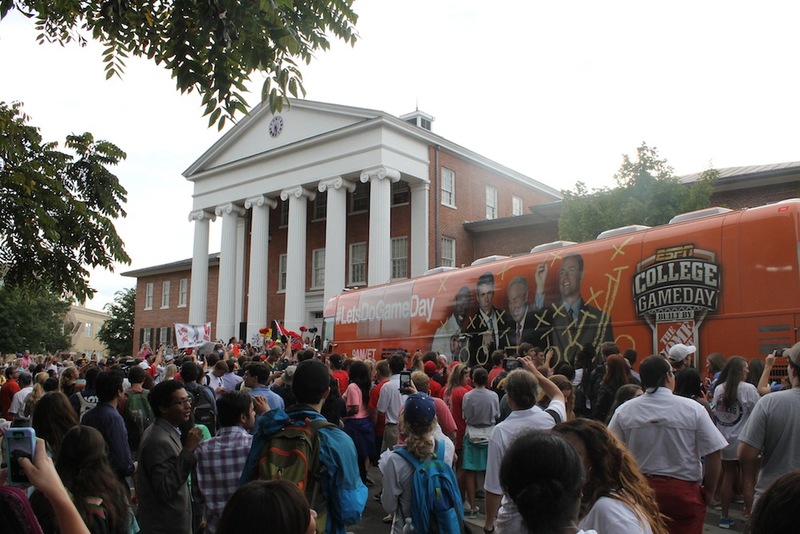 I watched the ESPN College Gameday bus drove on campus for the first time, and all I could muster was tremendous pride. The juxtaposition was just too strong…the same spot where rioters gathered in 1962 to uphold the “values” of a regressive mentality was now a gathering place to celebrate the genuine joy of being part of the Ole Miss family. Members of the national media finally returned to the famed Lyceum steps, but this time they came to honor a Great American University, not report its cultural downfall. The impact is almost too great to comprehend. My personal journey through the halls of the Lyceum came just as the modern era of change began on campus. And now, looking back, I have never been more proud of where we are going. Our culture, beauty, hospitality, and inclusion, was on full display for the world to see this past weekend. ESPN’s College Gameday didn’t just see it, they loved it. From my apartment in Nuremberg, Germany, (where more people ask me about The Blind Side movie than racism in relation to Ole Miss) I watched every second of ESPN’s College Gameday and that awe inspiring view of Hemingway Field full of students. As I looked on I thought: they are not just Mississippi students or Southern students, but Ole Miss students from all 50 states and over 90 foreign countries. They cling to an Ole Miss identity that is never completely divorced from the past but just took a thousand steps into the future. The journey is not over; all battles are not yet won. We will keep navigating this road together, Rebels. As expected, some of us will rebel. But I believe now, with confidence, that the course we are charting will guide us all back together, to a place that will continue to make us proud. In his post game interview Hugh Freeze shouted through tears, “I wanted to deliver a winner to this state, my home state. They are great people. They deserve a product that makes them proud.” He is just the football coach. He is not a political leader, social activist, or university chancellor. He is a coach of young men who play a game. But he functions as a cultural leader who comes to work everyday with a love in his heart and a desire to strive for excellence for his, my, our beloved Ole Miss. And by far, he is not alone. He represents you, Mississippi and Ole Miss. He stands with AD Ross Bjork, Chancellor Dan Jones, and countless student and faculty leaders who are forging a new legacy in Oxford. Saturday’s national spotlight shone bright on the Lyceum, the Grove, and Vaught-Hemingway stadium because more times than not you, the Ole Miss community, are choosing to listen to the better angels of your nature in the face of hard change. It has not been flawless and it is not yet complete, but you are fostering a space of hospitality, open to all who have the joy of attending. For this, Ole Miss is advancing, regardless of the result on the field.